I'm Dr Bob Gill, a family doctor and NHS campaigner based in South East London. Over the last few years I have become aware of creeping privatisation in our National Health Service. There has been a concerted effort by consecutive governments to convert our NHS to a profit driven private health insurance system. In 2014 I co-produced a film, "Sell Off – The Abolition of your NHS" which explained the dismantling of our health service. It has been shown at screenings around the country and been well received by audiences, judging by the feedback at over 50 such events I have attended in the last 18 months for Question and Answer sessions. I've had many requests to make another film. Our new project "THE GREAT NHS HEIST" will make clear what is going on and how the final betrayal will play out unless we act to stop the heist of our NHS. We will explore the measures being taken to drive us to an American-style health system and what is in store for us in a for-profit system. Our film can be made, with your support. We won't have money for stock footage or fancy music but if we can raise enough to get to all our interviewees and cover our equiment costs then we will be able to tell this important story. All the people involved are putting in their time and expertise voluntarily. 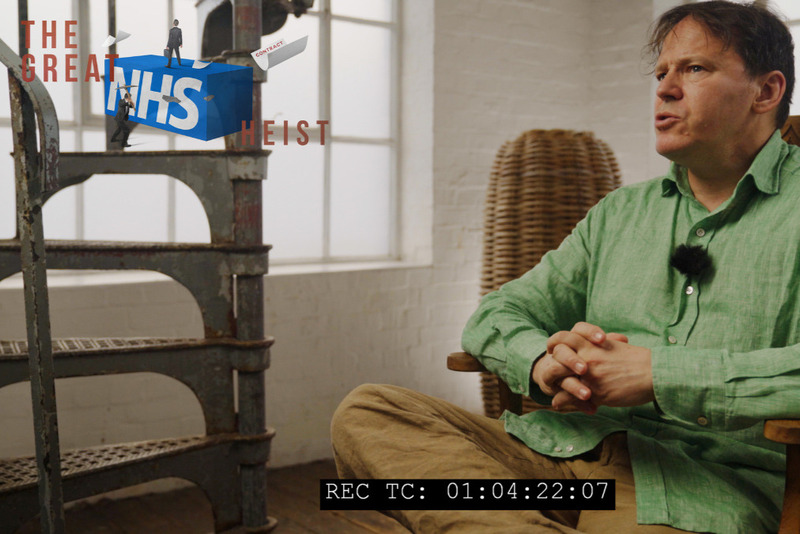 I thank you for supporting this project and the people donating time, expertise and resourses to "THE GREAT NHS HEIST" documentary. All donators will be credited in the film, and merchandise will be shipped free of charge to UK addresses. International shipping fees apply. Check out Film trailer!!! recently completed with music from Dave Randall. In the last few days we were lucky enough to be able to interview David Graeber. This was the last planned interview for the film. At the moment we are working on editing and have taken over 40hours of interviews down to under two hours. We have people on board with the project for the soundtrack colour grading and opening titles. We have to generate all the on screen graphics, film a bit more incidental footage and the film will be ready. We thank you for you support, please keep spreading the word to help us reach our funding goal. Help us finish our film, and inform a wider public about The Great NHS Heist. As the election looms, the Naylor Review has been overlooked - the future of the NHS has never been more in doubt. See why in my latest video, a discussion with Dr Sarah Gangoli - keeping you informed on why your vote tomorrow matters. Maybe ask Michael Moore to help out....you never know he might be well up for it. Anyway good luck. if you want to help create a window into a near future of profound ingenuity, come on down and check out my page Quantum(startup). You might like to know that according to English Law you may trade your rights. Thus, if you are affected in any way, shape or form by any thing happening around you, you may quote as much as you wish for doing or suffering anything you are not in an Act of Parliament told you must do or suffer at your own expense. If you would like more info on this message me. I have already tested this application of contract Law in the High Court and I walked out of Court having heard the judge say, "This is an ingenious application of contract law that forces a return to the basic principles of contract." Another judge said, "Think what this will do to this country if you proceed with this matter." You may use my copyright application of contract Law because it protects your English Common Law right to do as you please by creating a situation that automaticlly entitles you to claim as much as you wish to charge for doing or suffering anything you are not legally obliged to do or suffer at your own expense as well as giving you a lein on property held by those you wish to contract with whilst also authorising you to take back property that becomes yours as a consequence of their unavoidable acceptance of your offer. see unilateral, take it or leave it, accept or go without offer to contract. There is no fee to pay only an honest business profit to be shared equally with everyone entitled. There is much more to this than just the above but, surfice to say you have nothing to lose and the everything to gain. People like me only come round once every few hundred years so please do not miss out. This only works if you can admit the truth about everything. Virgin health care pay a grand a year less for a health care employee compared to the NHS I thought they were non profit making maybe I've misunderstood??? Thank you for your support! All donators will receive a credit in the film. (Unless your donation is anonymous). As a token of our thanks we'll send you a The Great NHS Heist sticker pack in the post. As a token of our thanks we'll send you a a sticker pack, mug & signed poster. As a token of our thanks we'll send you a sticker pack, coffee cup, premium framed & signed poster & invitation to our private screening. You will receive a full executive producer credit & a sticker pack, coffee cup, premium framed, signed poster & invitation to our private screening. This is a great campaign led by Dr. Bob. We must save our NHS! I believe it is imperative that as many people as possible understand how our NHS is being destroyed.